Nova Scotia is full of stories. About a half hour outside of Amherst, one drives by a rather picturesque bridge. Built in 1888, it is a remnant of a bold, innovative idea that came so very close to making it into reality. Remains of the historic Chignecto Ship Railway can be seen at Tidnish Bridge, Nova Scotia. 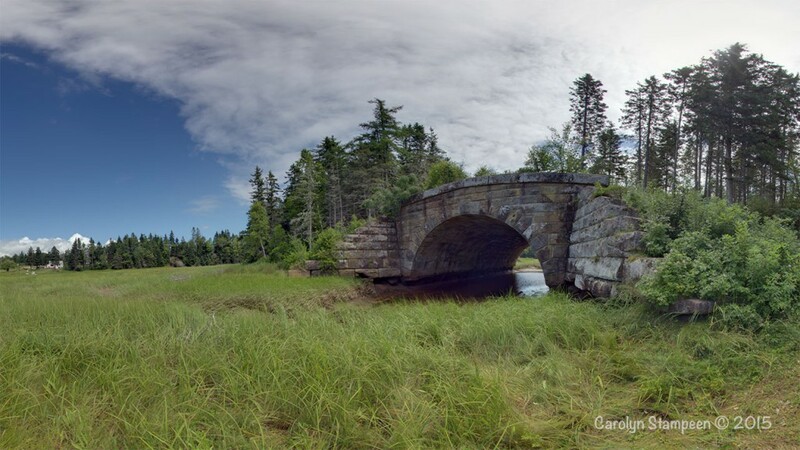 Tidnish Bridge, Nova Scotia – Click HERE to launch interactive 360˙ tour. There are 6 scenes to visit between the historical stone bridge and the newer suspension bridge nearby. 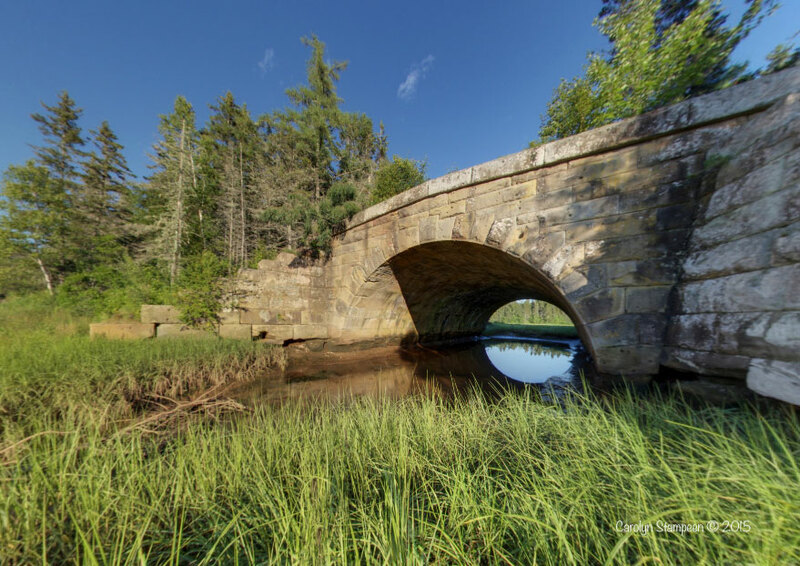 Be sure to “chase the suns” (click on them) in this interactive 360˙ virtual scene to navigate from one scene to the next, to take a virtual tour from the Tidnish Bridge to the nearby suspension bridge. The Tidnish Bridge, also known as the Keystone Bridge, remains as a testament to Nova Scotia’s most ambitious engineering feat! 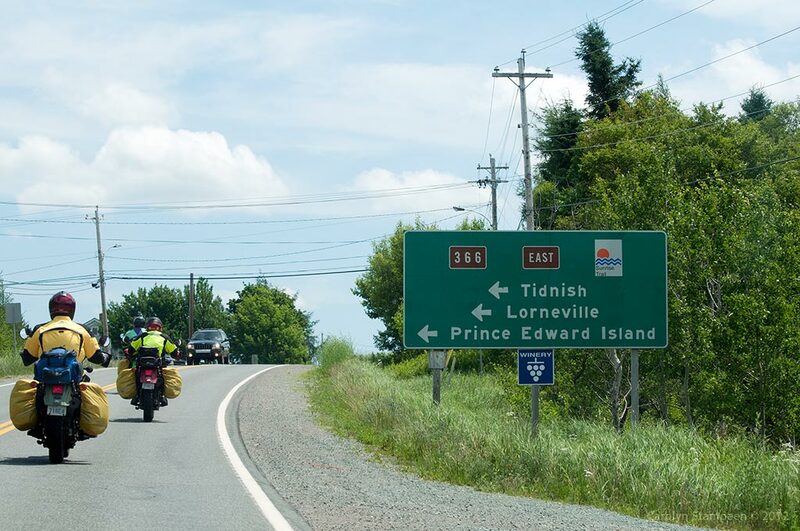 Nova Scotia is joined to mainland Canada by the narrow Isthmus of Chignecto. Its narrowest point is only 24 km wide. It’s flat, close to sea level and much of it is marshy. As early as 1689, thoughts of building a canal were bandied around. Wouldn’t it be grand if ships out of Port Royal, located in the Bay of Fundy, could just sail up the Bay, then travel through a relatively short canal, to get to the St. Lawrence seaway and Quebec City, instead of having to sail all the way around the province? As time went on, the idea of shortening the 930 km distance required to sail around the province kept percolating. Shipping traffic along the Atlantic seaboard, the Bay of Fundy and the St. Lawrence continued to grow. Then the age of the railway dawned, further transforming the continent. In 1875, a brilliant Canadian civil engineer, Henry Ketchum, conceived the idea of transporting vessels across the Isthmus of Chignecto by pulling them across a straight flat, 27km stretch of the isthmus by steam-powered locomotives. A ship would sail into a cradle that would be lifted onto the railway, would then make a 2.5 hr trip, from Tidnish Dock on the Northumberland Strait side of the isthmus to Fort Lawrence on the Fundy side, then the vessel and cradle would be lowered back into the water on the other side. In 1882, the Chignecto Marine Transport Railway Company was incorporated as a federally chartered railway and in 1888, construction of the Chignecto Ship Railway began. Folks marvelled, engineers were excited, 4000 men were employed to work on it. Sadly, from the outset, the venture was plagued with bad luck. In 1891, with 3/4 of the project completed, construction halted. Ketchum fought for years afterwards to finish the work, but in the end, the marine railway was dismantled and sold to pay creditors. Remnants of the railway itself can be seen in the nearby Tidnish Dock Provincial Park and here with the Tidnish Bridge. Other parts are now either overgrown or used as recreational trails. 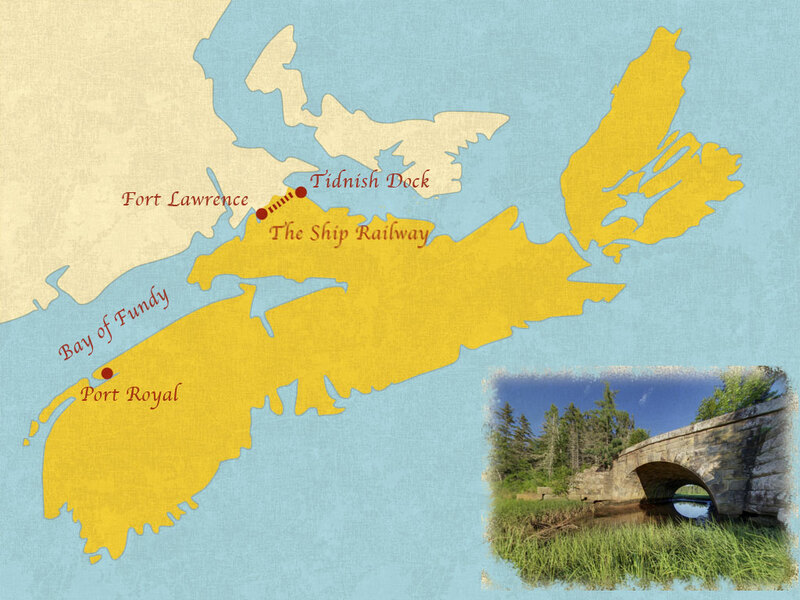 In the early 1990s, the 4 km stretch of abandoned railway bed of the ill-fated Chignecto Ship Railway lying between the Tidnish Dock Provincial Park and the Tidnish Bridge was developed into the Ketchum Trail. A suspension bridge was built over the Tidnish river as part of this development. Yes, it moves as you walk, which can be a wee bit disconcerting for the novice suspension bridge walker. But don’t let fear stop you: once you’ve crossed it once or twice and that thing you knew about the bridge not going to fall apart actually sinks in, you’ll feel like a pro. Make sure to enjoy that wonderful view of the river. If you go at different times, you will notice that water levels in the Tidnish River will change. This river empties into Baie Verte and is strongly influenced by the ocean tides. Go get here, take the 366 East exit on the sunrise trail, heading out of Amherst. This entry was posted in Hike, History. Bookmark the permalink. I would just like to congratulate you on the great presentation and information, all are very well done. I travel all over the world and have made books of the countries I have visited but there is no place like our own Nova Scotia which I try to see all of very year. Sunrise Trail tomorrow and that is how I came across your great work, keep it up.